North Korea has been open to Western visitors for more than twenty years now, but even a two day trip to Pyongyang will set you back over $1000, and must be organised at least a month in advance. In January I opted for the cheaper and more popular tour to the abandoned border village of Panmunjom. For $80 the tour takes you into the Joint Security Area (JSA) contained within Panmunjom. Here you will find the only portion of the Korean Demilitarised Zone (DMZ) where armistice negotiations are conducted, and where troops from the North and South stand close enough to trade icy glares and the occasional pot-shot. As the bus winds slowly northwards out of Seoul the concrete apartment blocks give way to icy rice paddies and riverbanks lined with barbed wire and sentry posts. We pass open-topped trucks full of steamy-breathed soldiers, and go through tunnels lined with dynamite, designed to collapse and buy precious minutes in a North Korean tank advance. The first security checkpoint comes before we cross the bridge over the river Imjin, which marks the southernmost boundary of the DMZ. A South Korean soldier boards the bus and checks everyone’s passports. He’s incredibly young (South Korean youth must undertake compulsory military service), but a large rifle is strapped to his back. Our bus is given permission to cross, and we begin weaving between the spiked yellow barrels littered across the road. On the other side a cheery blue sign welcomes us to the JSA and Camp Bonifas. The camp, only 500 metres south of the border, looks like a leafy high school, only with mortar drills on the baseball field. A US Army Captain tells us that after arriving at the border, we should not point or wave; North Korean soldiers have been known to take photos of tourists to use in propaganda pieces on Western spies. We will only be able to cross the Military Demarcation Line and enter the North’s territory while inside the conference room straddling the border, but we’re not guaranteed entrance today because a North Korean tourist group might get there first. Before we leave, our tour guide makes us sign a waiver – it’s horribly misspelled, but the general gist is that I acknowledge I will be entering a hostile area, and I will not rely on the US nor the Republic of Korea for my safety in the event of enemy action. We board a bulletproof military bus accompanied by an armed US soldier. “The eagle has left the nest,” he proclaims as we head up a road through the landmine-studded woods. Then, as we round a corner and North Korea comes into view for the first time, the most amazing thing happens: golden beams of sunlight break through the heavy clouds. 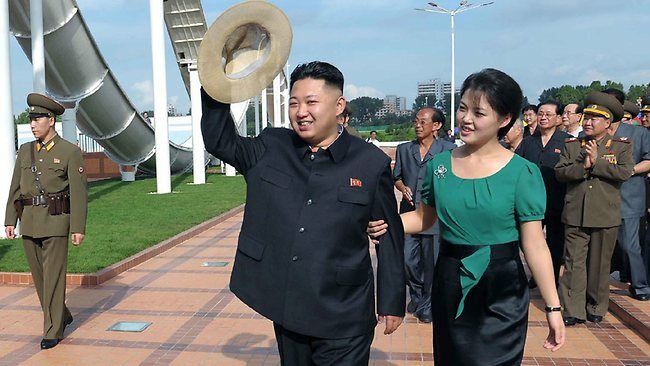 In North Korea, everything is sunny all the time always. At the base of the hills our tour guide points out the world’s third tallest flagpole towering above the village of Kijong-dond, widely referred to as ‘The Propaganda Village’ for its hollow tower blocks built to create the impression of prosperity. Such heavy-handed image manipulation is typical in the DMZ: on the south side we get Freedom Road, Freedom village (where South Korean farmers require an armed guard during harvests to prevent kidnappings), and 50 metres south of the border is Freedom House – a nondescript military building used by ambassadors to prepare for armistice talks. On the other side of a marble hall we pass through glass double-doors and finally behold the border. It’s a large courtyard containing the three parallel blue huts used for armistice conferences. A series of white pickets known as the Military Demarcation Line runs left to right and through the middle of the huts, marking the border. Our side of the courtyard is covered in gravel, the other in sand. Freedom House is mirrored on the other side by Panmun-guk, a concrete building from the conspicuous magnificence school of communist architecture. Security cameras spike its surface, and a lone North Korean soldier stands by its diminutive doors, a pair of binoculars glued resolutely to his eyeballs, surveying us for any sign of Western insolence. It’s our lucky day; no North Koreans have beaten us to the Military Armistice Control conference room, so we file into the middle of the three blue huts, where we stay for fifteen minutes. It’s just a wooden hut with a conference desk, occupied by two South Korean soldiers in oversized helmets who are happy to pose for photos. I’m overwhelmed by that disappointment common at sites of historical significance – everything seems a little too small for what it represents. I’d come on this tour hoping to find a slice of the North Korea of Team America and sloppy VICE documentaries. Instead I found the quiet absurdity of armed conflict – a stagnant reminder that military might, diplomacy and ideology can fail us and all that we’ll be left with is a country that does not glow in night-time satellite imagery because they can’t afford to turn the lights on.